A refrigerator icemaker has moving parts and electrical components, but basically, it's a plumbing fixture, and many malfunctions can be traced to problems with the water supply. 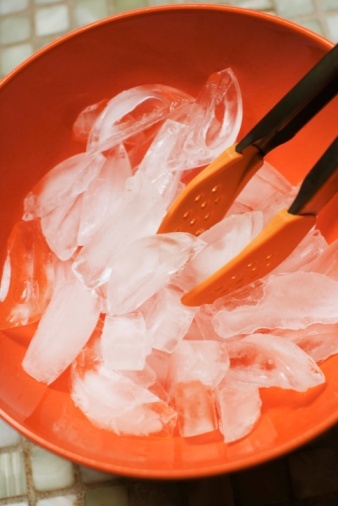 Low water pressure can be responsible for production of undersized ice cubes or no ice cubes at all. Mechanical malfunctions can also create issues such as runaway ice production or failure of the unit to transfer ice from the reservoir to the tray. Electrical malfunctions aren't as common, and you can often resolve them by resetting the icemaker. One thing you usually can't do, however, is disassemble an icemaker. When an internal component fails, you often have to replace the entire unit. Your icemaker won't work if the temperature in the freezer is too high. As appliances go, icemakers are fairly uncomplicated. A valve connected to the home's water supply opens to allow water to fill a reservoir, and then closes again. When the water freezes, a heater turns on momentarily to melt the cubes and prevent them from sticking together, then a gear-drive ejection arm pushes the cubes out of the reservoir and into a storage bucket, and the cycle begins again. Freezer Temperature Is too High: The icemaker won't make ice if the temperature in the freezer is above its cutoff temperature. The FDA advises that the ideal freezer temperature is zero degrees Fahrenheit, and most icemakers work best when the temperature is below 5 degrees Fahrenheit. Your icemaker may stop working if the temperature rises above 15 degrees Fahrenheit. If the temperature rises this much, and the refrigeration system is working and the door is closed, it usually means it's time to replace the door gasket. Icemakers are designed to work with a water pressure between 20 and 120 psi. If the pressure is too low, the ice cubes may be undersized or hollow, or the icemaker may not work at all. It's easy to check the pressure. Just pull the refrigerator away from the wall; locate the shut-off valve for the water line, and turn it off. Locate the water connection. On Kenmore, Whirlpool and other models, it's usually behind the refrigerator, and on some models -- particularly Samsung -- it's underneath the refrigerator compartment. Unscrew the water connection; point the water tube into a bucket and turn the valve back on. If you don't see a steady stream of water, you've found the problem with your icemaker. Look for the cause in your home's plumbing system. It could be a kinked tube, a partially closed valve or something else. As ice cubes collect in the storage bin, and their level gradually rises, they push up on a feeler bar inside the bin. This bar, which functions like the float in a toilet tank, disables the fill cycle when the bin is full. 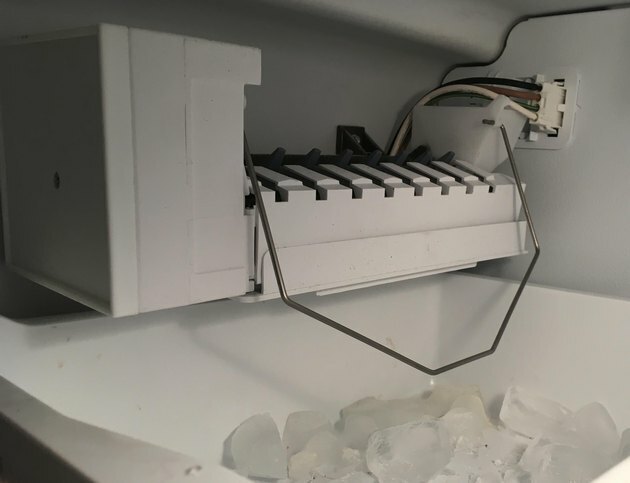 If you see this bar pushed up against the bottom of the icemaker, but the tray isn't full, the bar is probably stuck. Pull it down to release it, and the icemaker should start working again. You can also do a hard reset of the icemaker's electronic circuitry using the procedure recommended by the refrigerator manufacturer. Samsung icemakers have a very visible red reset button, which you should push and hold for up to 10 seconds. To reset a Kenmore icemaker, turn off the icemaker switch, unplug the refrigerator and wait for 5 minutes before plugging it back in and turning on the icemaker. Some Frigidaire refrigerators have an an on/off button for the icemaker located on the front control panel. To reset the icemaker press this switch until the LED turns red, wait a few minutes, then press and hold it until the LED turns green. For some GE and LG models, the only reset procedure available is to unplug the refrigerator and wait a few minutes before plugging it back in. When unsure, check the manual for your refrigerator model for the reset procedure. The feeler arm may be stuck because it's frozen, or the water pressure may be low because of an ice blockage in the water supply line. The latter is probable if you have small or hollow cubes and sufficient pressure in the external supply. Correct both problems by pointing a hairdryer at the icemaker or supply line to melt the ice. The icemaker is usually controlled by the door switch, which also controls the lights. If the lights don't go on when you open the door, the switch may not be working properly. Unplug the refrigerator; disconnect the leads from the switch, and test the switch for continuity, using a multimeter. If the switch doesn't show continuity (infinite resistance), replace it. Some of the troubleshooting error codes displayed on the control panel refer to problems with the icemaker. Look these up in the manual or on the manufacturer's website. One type of code usually signifies the ice sensor has failed, while another means the icemaker motor isn't running. When you get the second type of error code, the cause is often ice on the fan blades or ice covering the freezer air vents. Melt ice using a hair dryer.